Announcing a new page I added to this blog: Hair Care and Skin Care. I have included a list of all hair care and skin care products I use on Marlie’s hair and skin as well as a detailed instruction of our hair care and skin care routine. No need to check it out if you have your children home and have figured out your own hair care and skin care routines. However, if you are just starting out, you might find some of this information helpful, or at least a good starting off point. All of this valuable information can be yours, for a limited time, for the low, low price of: $19.95 FREE. And because you’re getting such a good deal on this information, you can feel free to take it or leave it. You can even disagree with it. Silently, of course. If you have questions, however, you can feel free to contact me and I’ll be happy to answer them as best as I can. Disclaimer: Everyone’s hair is different. 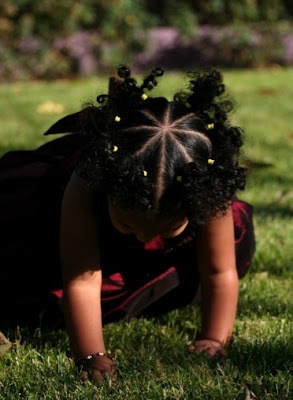 The products and routine mentioned in the Hair Care and Skin Care page on my blog is what works best on my daughter. * Individual results may vary. These statements have not been evaluated by the Food and Drug Administration. @2008 No Rights Reserved. Thank you for sharing your hair and especially your skincare routine. I adopted two children from Haiti. One child has beautiful skin and the other child's skin is so dry. It has been especially hard to manage since winter hit. We are in Minnesota and heat with gas so the air is very dry.